This is a 50K ohm (503) 3296 series Multiturn PCB Mounting variable resistor. Multiturn potentiometers are used in application where accuracy and precision is important. As the name suggests the need to turn the know several times for going through the full scale of 0K ohm to 50KOhm. This 3296 series multiturn variable potentiometer can also be easily mounted on breadboard. Related Information -Benefits of using multiturn potentiometers. 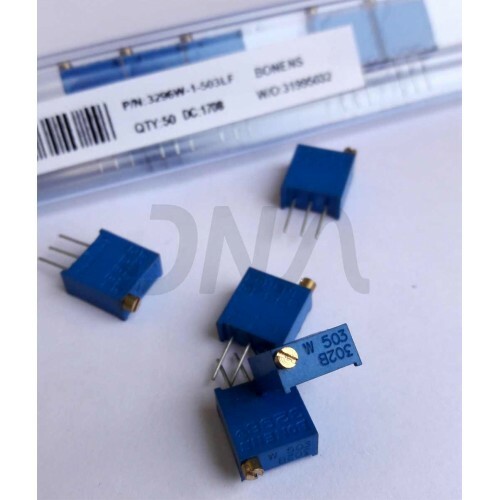 3296 series 20K ohm Multi-turn PotentiometerThis is a 20K ohm (203) 3296 series Multi-turn potentiom..
3296 series 100K ohm Multi-turn PotentiometerThis is a 100K ohm (104) 3296 series Multiturn trim pot..
3386-50k Variable PotentiometerThis is a 50K ohm (503) 3386 series Preset/Trimpot/potentiometer. The..